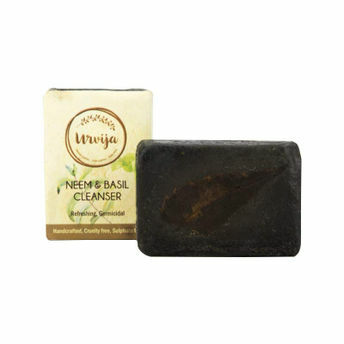 Urvija Neem and Basil Cleanser is a popular soap known for its cleansing and powerful skin healing properties. Neem is anti-fungal while basil is antibacterial together this soap helps to keep skin clean, removes body odour, kills germs, helps reducing pimples and rashes, reduces body ache and improves skin texture. It is suitable for all types of skin. Contains no artificial colors, and no synthetic fragrancesUrvija product range is hand crafted, cruelty free and completely free from sulphate, paraben or any kind of toxic chemicals. The raw materials are collected from sustainable resources.